Foreign Minister Elmar Mammadyarov met with the Minister of Foreign Affairs and Worship of the Republic of Argentine Jorge Faurie within his visit to Argentine, AzVision.az reports referring to the Azerbaijani Foreign Ministry. Minister Elmar Mammadyarov expressing congratulations to his counterpart for successfully hosting the UN High-level Conference on South-South Cooperation in Buenos-Aires stressed the importance that Azerbaijan attaches to the cooperation within this platform. Minister Mammadyarov noted that the developing countries face with the similar development problems and therefore, this platform contributes to sharing and discussing the common views, experiences and methods of national development strategies and priorities. 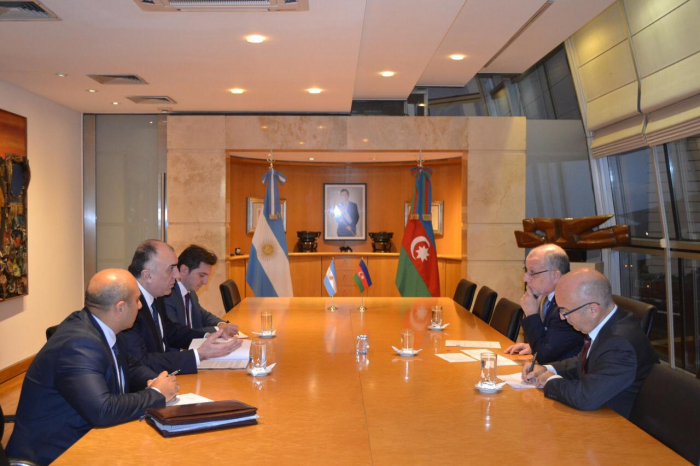 At the meeting, exchange of views was held on the current situation of the Azerbaijan-Argentine bilateral relations and the issues of the cooperation agenda. Noting the existing wide prospects for cooperation in the fields of agriculture, energy, transport, health and tourism, common intention for strengthening the joint efforts were expressed.